School’s out for the summer – excuse me while I feel a bit crazy with both excitement AND worry! I’m looking forward to more time with them, less rushed mornings, creating our OWN schedules, and plenty of family adventures. I’m also a bit nervous about the ‘I’m bored’ phrase that I know will occur far too often. That, along with ‘I’m hungry’, of course! 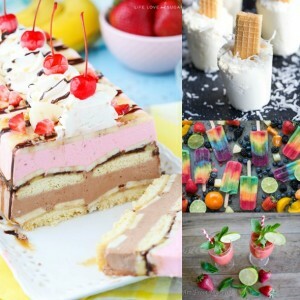 Luckily we’ve got plenty of delicious recipes for kids with these 50+ Cool Summer Snacks! Disneyland is one of my favorite places, if you haven’t noticed by all the posts I do about it. 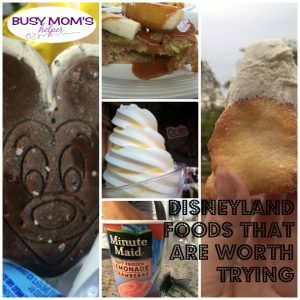 This time I wanted to know if the Disneyland foods were worth the price, and yes I was very surprised by most of them. So here is a list of Disneyland Foods that are Worth Trying. Contains affiliate links that help support this blog. See our Disclosure. Disneyland Foods that are Worth Trying will show you some places to get meals or just simple snacks like the Matterhorn Macaroon, which was amazing! Now some of these are a little pricey but worth getting instead of just bringing your own sandwich or McDonalds outside the park. Book your Disney vacation with Get Away Today for the best deals – and use Promo Code: BusyMomsHelper for extra savings! First stop was the Plaza Inn on Main Street USA in Disneyland. This was an all you can eat breakfast with Mickey Mouse Waffles, sausage, cinnamon rolls, drinks, cereal, and a melt in your mouth French toast. We definitely ate way more than our stomachs could hold so we had to stay off some big rides for a while but completely worth it, and it filled us up for hours. With the amazing all you can eat food you also have characters walking around saying hi and taking pictures with you. This is obviously a full meal and it was a little pricey but worth every bite. My favorite on this list of Disneyland Foods that are worth trying is the Matterhorn Macaroon. This is a coconut, melt in your mouth snack that you will absolutely not want to miss. It is located just inside Jolly Holiday Bakery Café which also provides a great view of the Matterhorn. Dole Whip from the Tiki Room is also a must have and a perfect treat to enjoy while watching the Enchanted Tiki Room. Dole Whip pineapple ice cream in the style of soft served or a float is sure to quench your thirst for something sweet. Princess and the Frog is one of my favorite Disney shows so when I heard Tianna’s Beignets were served in New Orleans Square I was there. These beignets are delicious, better than doughnuts, and during Halloween time you can stop by for pumpkin flavored beignets. Cinnamon rolls at Fiddler Fifer and Practical are warm and very filling. These cinnamon rolls we get every time we go to Disneyland because they are a perfect and quick breakfast. They also serve as a Starbucks so all you coffee lovers will also love to stop in. Disneyland too hot for some of you? Well cool off with one of Disneyland’s Minute Maid Frozen Strawberry Lemonade. These are cold and perfect for those hot days in the park, and conveniently located at the ice cream carts throughout the parks. Also located at the ice cream carts you can grab a Mickey Mouse ice cream sandwich, sure to add excitement to your little kids. Pizza is always a great dinner right? Well it smells amazing and at the Pizza Port by Space Mountain they have pasta, pizza, salad, drinks, and several items at a reasonable price are sure to fill up your whole family for more fun memories at Disneyland. Flo’s Café in Cars Land is one restaurant that I never even really knew about, well I missed out. Flo’s is a little pricey but you do get a lot of food and the food is delicious. I got the Brioche French Toast and my husband got the American Breakfast. Both were amazing, now the Brioche French Toast not only sounds a little different than what I am use to but it looked a lot different too but don’t be fooled, it was melt in your mouth, more of a dessert than breakfast French toast, so go ahead and be adventurous. Need a late night snack? Well it was big enough to be a meal so be prepared to share. Ghiradelli Soda Fountain and Chocolate Shop in California Adventures has and wonderful Crissy Field Cookie Bits Sundae, hot fudge, cookies and cream ice cream, whipped cream, and lots of chocolate chip cookie bits on top what’s not to love? This dessert was huge which didn’t stop my husband and me from eating all of it but if you can’t eat very much ice cream or sweets find some people to share with, I’m sure it won’t be hard to convince people. Churros are also one of those things you always get at Disneyland and they make it easy by having a million stands selling them. I think I smelt churros all the way through the park which made it horrible not eating one every five minutes. Last but not least, our family tradition of going to Goofy’s Kitchen for dinner. Goofy’s Kitchen isn’t in Disneyland itself but in Disneyland Hotel so it kind of works. This is an all you can eat buffet with ribs, pizza, pasta, chicken, salad, fruit, huge dessert bar, and drinks. They also have characters walking around taking pictures and signing autographs and randomly dancing through the restaurant. One of my favorite things there is their Crème Brulee , it is amazing and I think I ate six of them, oops, probably not great on my weight but totally worth it. There you have it, Disneyland Foods that are Worth Trying, plus there’s millions of other foods in the park that are just as amazing so if you go to Disneyland try to set a little money aside to indulge in some of their mouthwatering foods. Don’t forget to check out Get Away Today for the best vacation deals, plus use Promo Code: BusyMomsHelper for even more special savings! 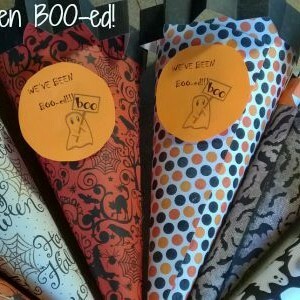 You’ve been BOOed! This is Nikki and one of my favorite holiday traditions is ‘You’ve been BOOed!’ gift for Halloween. I love sneaking up to a neighbor’s house and leaving some goodies, but instead of a plain old paper plate this year I’m going to leave a festive treat bag. This bag is easy, cheap, and way cute for all your neighbors. It is also very customizable in size, patterns, and looks. Fold square paper into a cone. Try making the tip pretty pointed so your treats don’t fall out the bottom. Glue the edge to hold together. Careful you don’t burn yourself! With the wire or a pin to get started, on both sides about 1 ½ inches down poke a hole for the wire. Over the place two pieces of tape on the inside and outside for extra strength. Put the wire through the whole and twist to secure. Take your piece of 12 x inch paper and fold it to make it look like ruffles. Glue to the top of the cone. Can put two strips all the way around or just in the front. Print out this We’ve been BOOed tag, and this poem plus sign for the window. Tape the small tag to the front of the cone.